Industrial strength two-part epoxy is designated for heavier items requiring an extra-high-strength bond. Works on metal, stones, ceramic, crystal, china and wood. Waterproof and resistant to most chemicals. Strong enough to fill gaps. Sets in 30 minutes, cures in 12-16 hours to a clear transparent finish. Excellent for jewelry. Here's a fun project using 2-Ton Epoxy: Cold "Enamel"
Create some bezels as you would for holding standard enamel. 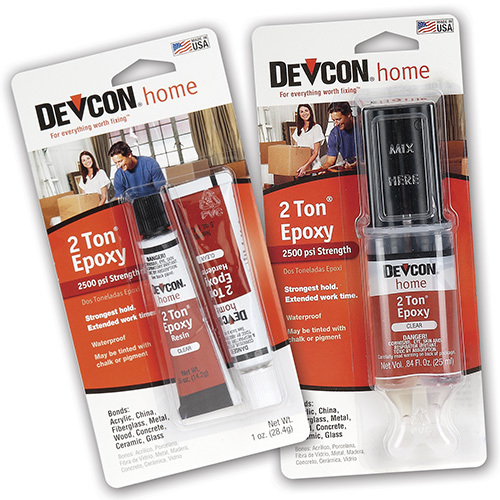 Using the Dev-Tube, mix 2 parts of epoxy with 1 part of enamel. Stir the mixture well to make it as smooth as possible. Make as many different colors as you need for your design. Fill the design (a syringe works best for filling tiny areas) and let it harden completely. Then sand it flat. Drip some water onto the sandpaper before sanding. Start with 220 grit sandpaper, then proceed to 400 grit, then 600 grit. That's it! Leave your creation with a matte finish or coat it with clear enamel (clear nail polish works well) for a shiny finish.